Which are the main features we need to have in our sewing machine? In this article, we’re going to tell you about the 10 main features that we need to have in our sewing machine. If you are planning to buy a new sewing machine soon but are confused or not clear about the features that should be in your sewing machine, then reading this article, might help you a lot. Here, below all the main features that a sewing machine should have are listed. 1. When the machine is stopped, most of the sewing machine allow you to place the needle in one direction only, either in the upward direction or downward direction. You should look for a sewing machine which allows you to place the needle in the upward as well as in the download direction as you like. This feature is helpful when you have to fabricate and stich multiple fabrics and cloths at the same time with each other. 2. Automatic Needle Threader is also one of the greatest feature of a sewing machine. Automatic Needle Threader will help you save a lot of time. In general we need to adjust the needle threader manually, so time is wasted. So, you should look for this feature in a sewing machine. 3. These days, sewing machines have different variety and types of buttonholers. 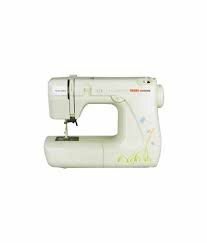 You should look for the sewing machine having the right type of buttonholers as per your requirement. 4. The modern electric sewing machines are able to put different type of stiches on cloths and fabrics of different kind. You should look for a sewing machine feature called as Build-in Stiches in your swing machine. More the number of patterns offered, more will the machine featureful. 5. We all know, we have to attach various kind of attachments with the machine sometime, you have to find a sewing machine that comes with various kinds of attachments that fix easily anytime with the sewing machine. 6. Weight of the machine is an important feature of the machine. Lighter will the weight of machine, easy it will be for us to take it anywhere we want. 7. Pressure Foot is something that let us enable the machine run by working as on-off switch for the motor. Adjustable Pressure foot is a cool feature that you should look for any of the sewing machine that you are going to purchase. 8. Free Arm should be provided in the machine. This helps you to operate the sewing machine even when there is no electric power source. 9. Top Load Bobbin is also an important feature with which you can easily fit the bobbin of thread down below without opening it enough. 10. In the old sewing machines, we have to manually lift the thread up from the bobbin fitted down below but a feature called Bobbin-Thread Lift helps a lot. So, these are the features that you should look for in any sewing machine that you are going to purchase. Buyers can observe Usha silai machine price list at silaimachine.in site before buying them online from different online shopping portals.